After running Sunderland close last weekend, Walsall will be hoping to do the same again to another promotion hopeful when Barnsley rock up to the Banks’s Stadium. The Saddlers have slipped into the relegation zone in recent weeks, and could pull themselves out of it with three points. The Tykes will be tough opponents, however. They are still unbeaten in 18 games, winning 11 and drawing seven. League leaders Luton Town face a tough task as Play-Off hopefuls Doncaster Rovers head to Kenilworth Road. The last time Mick Harford faced Rovers in the dugout came back in 2008, but it was the away side who came away with the three points in a 2-0 win. The Hatters are currently enjoying a 25-game unbeaten run in League One, last tasting defeat in October. Coventry City take on Oxford United at the weekend hoping they can claim another three points as they look to secure that final Play-Off spot. The Sky Blues have only lost one of their last eight league games, winning against the likes of Accrington Stanley, Fleetwood Town and Peterborough United. The Us recently dragged themselves out of the relegation zone with three points against Bradford City; another victory here could prove vital for their survival. After defeat against Oxford United at the weekend, Gary Bowyer’s Bradford City side are now rock-bottom of Sky Bet League One. A positive, however, is that the Bantams have won eight of their last 10 home league games against Blackpool who are their opponents on Saturday. But the Tangerines have won their last two league games against Bradford, scoring eight and conceding two. Managerless Rochdale are only two points and one place ahead of Bradford City, and are in action against Scunthorpe United this weekend. Dale striker Ian Henderson has been in red-hot form once again this season, and has scored 36.4 per cent of Rochdale’s 44 league goals this season. Both sides will be looking to get back to winning ways, but if recent form in this fixture is anything to go by, this will probably finish in a draw, such has been in the last three fixtures. The great escape is well under way for Wally Downes’ AFC Wimbledon, 10 points out of a possible 12 in recent weeks has gone a long way to pulling themselves off the foot of the table. The Wombles are looking to complete a league double over the Gills for the first time since the 2011/12 season. Gillingham picked up a fantastic point in the road last time out against Luton Town, a stunning Luke O’Neill free-kick the highlight of that affair. Crawley’s last game was certainly one of the results of the season, though they won’t want to relive it. A 6-1 defeat at the hands of Crewe Alexandra will have dented their confidence, but they have the chance to put that right with a victory over league leaders Lincoln City. 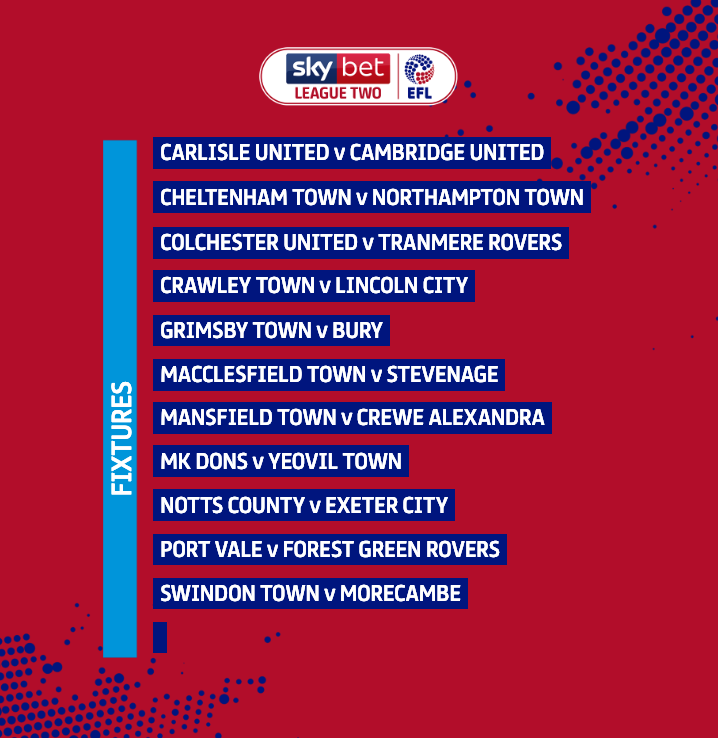 The Imps are on the charge in Sky Bet League Two, and are only five wins away from securing promotion; they are currently on a 15-game unbeaten streak too. The Shakers are currently six points behind leaders Lincoln, but do have a game in hand over the Imps in the coming weeks. They head to Blundell Park to take on Grimsby Town on Saturday, looking to record a league double over the Mariners for the first time since the 1990/91 season. Michael Jolley’s side will be looking to recapture some form which fired them up the table – they have failed to win in their last five League Two games. 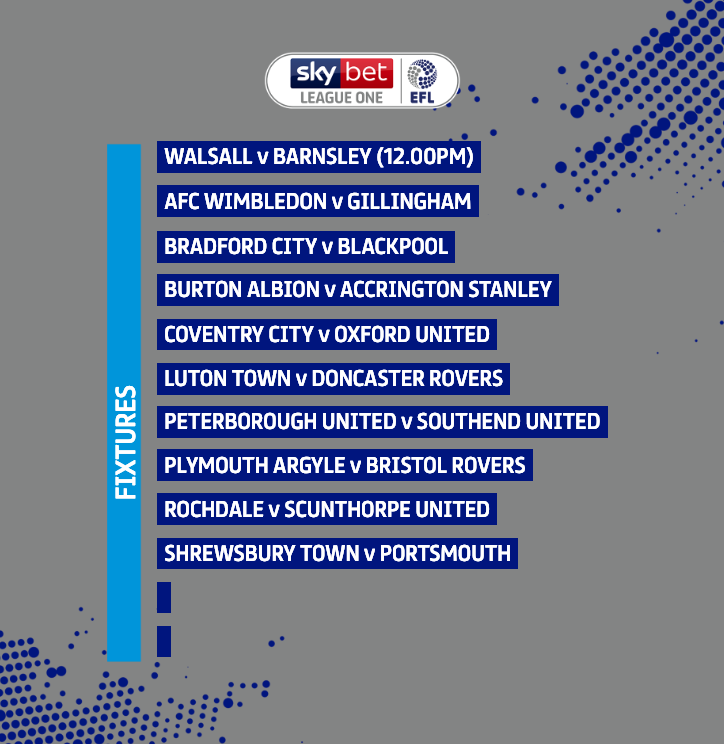 Arguably the game of the weekend in Sky Bet League Two sees two promotion hopefuls, Colchester United and Tranmere Rovers, face off against each other. Positioned eighth and fifth in the league standings respectively and with only four points separating the two teams, three points could be massive in the race for a Play-Off place. Tranmere are looking for their six consecutive victory in the league, having last done so back in 1991. It has been a tough season for Notts County so far, as they have found themselves inside of the relegation zone for a large majority of the campaign. The Magpies will be looking to register only their second win in their last six home league outings against Exeter City. Meanwhile, the Grecians will be looking to see off the threat of County for the third time in a row, something that they have never done in their 117-year history. Sol Campbell’s Silkmen came up trumps for him last weekend, as his side showed their class to upstage Yeovil Town on their own patch. This weekend they face Stevenage, looking to pull themselves closer to safety, but they have never managed to record a win over the Boro in a League Two fixture. Stevenage have been clinical this season, and find themselves in 10th spot, five points outside the Play-Offs. Forty per cent of their goals this season have come via headers. Yeovil Town sit just one position and three points outside the relegation zone in Sky Bet League Two. With a win over MK Dons this weekend, they could pull six points clear of the drop zone, depending on results elsewhere. MK Dons, however, have only ever lost one home match against the Glovers, playing seven, winning four and drawing two.